It was around this time last year that Amr Moussa announced that his meeting with the Muslim Brotherhood kingpin Khairat El-Shater failed to find a negotiated exit out of the political deal. “When I look back I am still convinced today that it was not at all possible to reach a deal with the Muslim Brotherhood simply because of their intransigence; they were not willing to give in to any of the people’s demands especially the one related to the early presidential election; they had a mental block; they made the 30 June inevitable,” Moussa told Ahram Online. “The 30 June demonstration could not have been avoided not because anyone was predetermined to ouster Morsi but because Morsi and his group had decided to shrug the public demands and to act according to their own agenda; it was impossible to let things go the way they were – not with the enormous mismanagement of state affairs that the Muslim Brotherhood had shown,” he said. Moussa does not blame Mohamed ElBaradei for rejecting a referendum on the ouster of Morsi in what could have, as critics suggest, blocked the debate over whether or not the ouster was legitimate. “30 June was a revolution; there are no two ways about it; it was a revolution in every sense of the world,” Moussa argued. “I don’t at all like this phrase; it is incompatible with the creed of our armed forces and with the way things are on the ground; the military are not ruling and have not been ruling since the ouster of Mohamed Morsi; the state and not the military has been in charge,” he said. According to the roadmap announced by El-Sisi, in the presence of ElBaradei and other politicians from the opposition but not Moussa, Egypt to see amendment of the constitution that was voted in under Morsi, then to have legislative elections and lastly to have the presidential elections. Moussa was at the head of the committee that reworked the constitution, which was later adopted by national referendum. Adly Mansour, who was chief of the Supreme Constitutional Court and was assigned to take over the top executive role during the transitionary phase. Mansour issued a decree to allow presidential elections first, following the argument made by some that the delay in the presidential vote was allowing for too much uncertainty and harming an already ailing economy. Preparations are now under way for parliamentary elections. Moussa, himself a former presidential candidate who came fifth in the vote that Morsi won in 2012, delined to either confirm or deny that he would be running at the head of a civil-democratic list to be elected MP and then to contest the speaker’s seat. At this point in time, Moussa is confining himself to talk of the “consultations to launch a coalition for the civil democratic forces that share the wish and the will to build a modern democratic Egypt, and who come from all walks of life – with no Egyptian citizen excluded for any reason other than proven, and not just alleged, legal wrong-doing”. Contrary to media speculation, Moussa firmly denies that a coalition was being built but was later aborted. “None of this is true; we are still exploring our options but no coalition has been made and no coalition has collapsed as I have read in some news coverage,” he said. Moussa also denies what has been “suggested by some unfortunate and inaccurate media coverage on the part of some” that the new political coalition is designed to lend parliamentary support to the new president, who unlike his predecessors, according to the new constitution, would need to rely heavily on the parliamentary majority to form a government and to pass new laws. “I myself have not spoken with the president, not even before his inauguration, of this parliamentary matter and he had not asked for all I know for the formation of a political coalition to lend him parliamentary support,” Moussa said. “But this is not to say that the entire parliament would be or should at all be fully on one side – there will certainly be opposition; obviously this is the way democracy is,” he said. The new parliament, Moussa argued, would be in charge of addressing some of the current problematic issues including for example the controversial demonstrations law that has been qualified by human rights groups as repressive and that has allowed for the arrest of activists both Islamist and secular – including many who had been in the forefront of the call for the 30 June protest. Moussa is willing, ever so reluctantly, to acknowledge some signs of repression, without saying the word. The politician, who has been very supportive of the nomination and election of El-Sisi, is firm in denying any responsibility of the president for the violations that have been recorded. Nor does he agrees with all of the complaints. 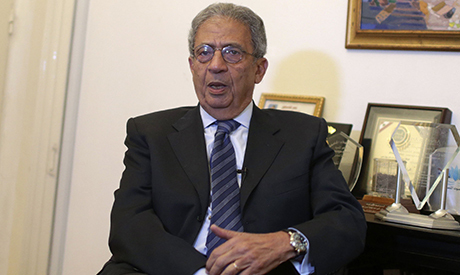 Moussa, who was foreign minister in the 1990s under former president Hosni Mubarak, also denied that the country is going back to the norms of the Mubarak rule. Repression of protests, intimidation of opposition, political censorship and control of the media are qualifications that Moussa firmly disagrees with. “You cannot say that these qualifications apply – not even if you look at the picture from the darkest angel. There are mistakes,” Moussa said. “And you cannot compare the situation today to what it was before the 25 January Revolution – because there has been the 25 January Revolution and there has been the 30 June which will always be a strong reminder of the consequences of state mismanagement,” he added. “We have a daunting challenge; the president as I know him and as I heard him is committed to do what it takes for success to be on our side; he knows he cannot afford to fail and nobody should want him to fail; it is not in the interest of any of us; it is not in the interest of the country,” he said. could this old guy for once be quiet? The Muslim brotherhood has more then a mental block Amr. They have multiple mental disorders, but they are too dangerous to be placed in insane asylums. So they are all caged where common criminals like them belong in prisons.